Gold To Continue To Base Below $1320 For Weeks – Technical Traders Ltd. This would likely result from a mild price rotation in the US major indexes and possibly weakness in the US Dollar. Weakness in the US Dollar and Equities Markets may be just enough impetus to cause Gold to rotate into the Momentum Basing pattern we have been expecting since January 2019. We’ve highlighted the price range, on the chart below, in purple. We believe the price of Gold will re-enter this range at least once or twice over the next 2~4+ weeks to set up a basing pattern. 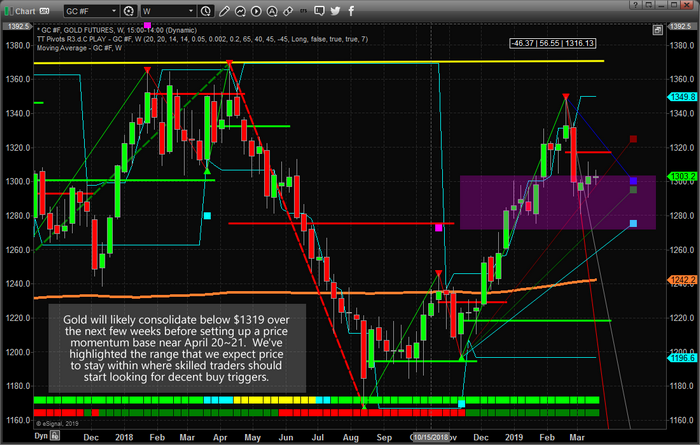 After April 21, we believe the basing pattern should be complete and a new upward price swing should begin. Take advantage of any price levels below $1290 because this may be the last time you see them for a while. We have also been sharing our stock market forecast looking forward 1-3 weeks from now which goes against everyone’s bias/sentiment including yours likely, but its something you should think about because you could give back a lot of profits if you don’t act now! Please take a minute to visit www.TheTechnicalTraders.com to learn how we can help you find and execute better trades in 2019. We have already positioned our clients for this move and we believe we can help you stay ahead of these markets. 2019 and 2020 are going to be incredible years for our subscriber the Wealth Building Trading Newsletter.